A Controller object is a non-user interface object responsible for receiving or handling a system event. What first object beyond the UI layer first receives and coordinates ("controls") a system operation? Controllers, across the board - be it in MVC or GRASP or Patterns of EAA - are all about receiving input and responding to events. I conceptualize it very literally: think of a video game controller. It responds to input events - the user pressing buttons. It doesn't necessarily know what to do when you hit a button, but it at least receives the event. Here, the NES Button Controller is a MVC controller which would keep track of the state of UI elements - for example, remembering what buttons were pressed in what order. Depending on application state (see Application Controller - another one!) 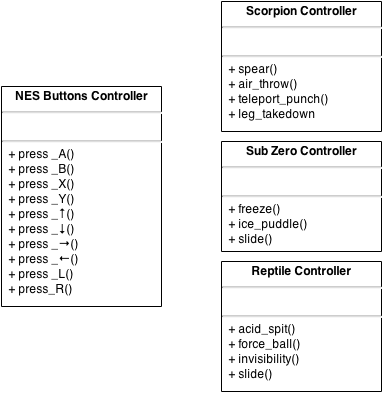 the NES Button Controller would response to certain button combinations by invoking methods on the other controllers - for example the Scorpion Controller - which are Use Case Controllers. What's important is that by looking at the design of these controller objects, you can quickly and easily enumerate the system events they respond to. Altogether, in the end, the MVC Controller is still a kind of GRASP Controller - as its methods tend to represent system events, which respond to user input. But there are other GRASP controllers which are not MVC controllers: Use Case controllers. A GRASP Use Case controller might respond to system events such as "user creates a new sale" while an MVC controller would respond to events like "system receives a PUT request for /sales/new" or "a java.awt.event.ActionEvent fires`". The famous coffee maker problem from Martin Fowler. Many examples of Adapter are trivial or unrealistic (Rectangle vs. LegacyRectangle, Ratchet vs. Socket, SquarePeg vs RoundPeg, Duck vs. Turkey). Worse, many don't show multiple Adapters for different Adaptees (someone cited Java's Arrays.asList as an example of the adapter pattern). Adapting an interface of only one class to work with another seems a weak example of the GoF Adapter pattern. This pattern uses inheritance and polymorphism, so one would expect a good example to show multiple implementations of adapters for different adaptees. The best example I found is in Chapter 26 of Applying UML and Patterns: An Introduction to Object-Oriented Analysis and Design and Iterative Development (3rd Edition). The following images are from the instructor material provided on an FTP site for the book. 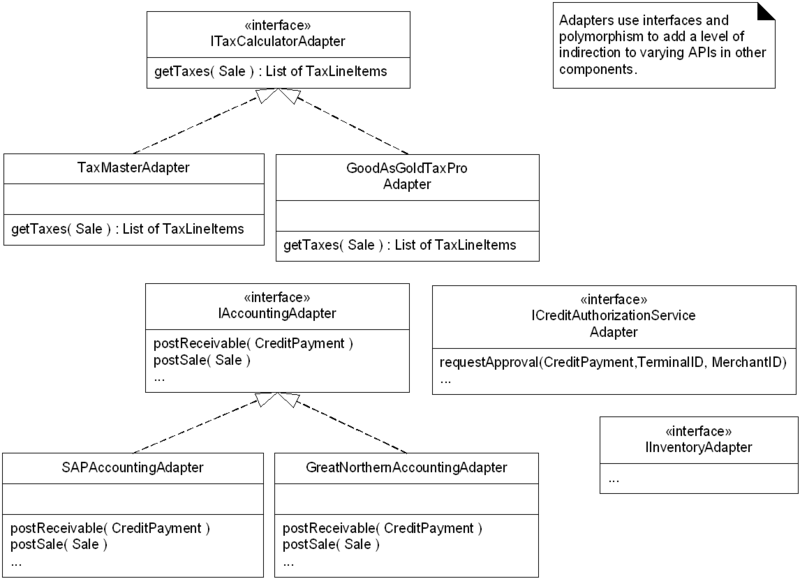 The first one shows how an application can use multiple implementations (adaptees) that are functionally similar (e.g., tax calculators, accounting modules, credit authorization services, etc.) but have different APIs. We want to avoid hard-coding our domain-layer code to handle the different possible ways to calculate tax, post sales, authorize credit card requests, etc. Those are all external modules that might vary, and for which we can't modify the code. The adapter allows us to do the hard-coding in the adapter, whereas our domain-layer code always uses the same interface (the IWhateverAdapter interface). We don't see in the above figure the actual adaptees. However, the following figure shows how a polymorphic call to postSale(...) in the IAccountingAdapter interface is made, which results in a posting of the sale via SOAP to an SAP system. 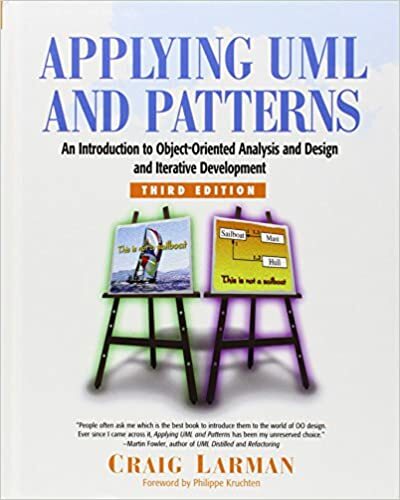 I like Craig Larman's Applying UML and Patterns: An Introduction to Object-Oriented Analysis and Design and Iterative Development (3rd Edition). Most PHP programmers would do well to learn habits like design patterns and GRASP. You could also "keep it in the family" and read the free online book Building Skills in Object-Oriented Design by Stack Overflow top-ten scorer Steven Lott. The solution of Strategy was already proposed https://stackoverflow.com/a/32798708/1168342, but this answer has some advantages. In this solution, a Sale is like your Order and ISalePricingStrategy is like your DiscountCalculator. ISalePricingStrategy is an application of the Strategy pattern (the name is in the interface), and Strategies are always attached to a context object. In this case, it's the Sale (or in yours, IOrder). The two classes I put in pink are optional. If you always give the best strategy to the customer (as in the pseudocode of the note I attached to GetTotalPrice) you don't need them. Larman explains you can go a step further and say that if more than one strategy applies, the calculation is either in favor of the store or the customer. Again, it's a question of instantiating the class and attaching it. The code to do this could be run from a "Configuration" menu command in your software. There are more flexible ways again to do this, using factories. See Larman's book for very cool examples in Java/.NET. GetTotal() handles (encapsulates) all the logic to calculate the total. If multiple strategies apply (e.g., online orders get 5% discount, orders over $200 get 10% discount) you may want to code how this is handled. Larman gives an example using Composite pattern where again GetTotal() works impeccably without the client code having to do anything special. You can extend other types of Strategies and instantiate them as needed. For example, for any order over $500 you can make the discount 50. It's a question of instantiating the new class in the code (not coding the logic).